Stem cell therapies hold extraordinary potential to revolutionize human medicine. Indeed, the global market for cell-based therapies is expected to surpass $20 billion by 2025, with an annual growth rate of 21%, as estimated by Scientia Advisors. Because stem cells have the ability to transform into a variety of cell types, stem cell therapeutic targets include cancer, neurodegenerative disease, heart disease, autoimmune disease, and musculoskeletal disorders. The choice of which stem cells to pursue for clinical applications depends both on their potential clinical risks and accessibility. 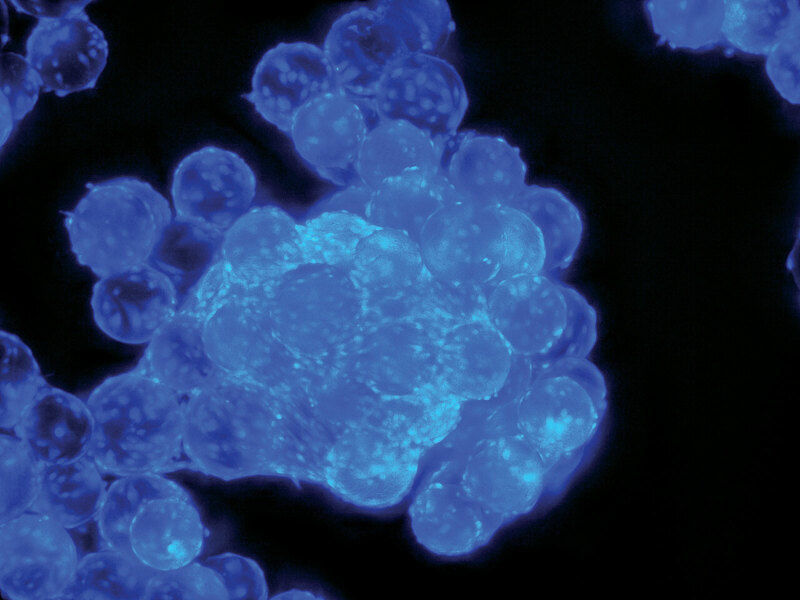 Stem cells can be isolated from many sources. For example, multipotent adult mesenchymal stem cells (MSCs) are readily harvested from the bone marrow of patients or donors for use in autologous or allogeneic therapies. MSCs can also be derived from blood, fat, placental and umbilical tissue, and other tissues. Stem cells of another type, pluripotent stem cells (PSCs), are isolated from preimplantation embryos. Also, somatic cells may be coaxed to return to a more primitive state, and become induced pluripotent stem cells (iPSCs), through the application of specific transcription factors. Various ways of developing therapeutic stem cells are of interest to stem cell manufacturers, who hope to make large-scale production of stem cells more efficient and economical. Production issues, as well as basic biology and application possibilities, were discussed at the Stem Cell Product Development and Commercialization Conference, a recent event that took place in Boston and was organized by GTCbio. Stem cell specifics addressed at the event included the necessity of developing more cost-effective manufacturing solutions, ranging from altering media formulations and vessel types to utilizing automated, closed systems in place of traditional cleanrooms. Other solutions described newly available plug-and-play systems for rapid cell expansion and included advice for when to consider outsourcing processes to knowledgeable partners. “To meet these challenges, our company has developed ready-to-use cellular starting stocks (cell banks) and bioprocess media systems that are designed for manufacturing scalability,” he asserted. “These products provide the only scaleup cell banks on the market and the only bioreactor-specific media systems for fed-batch processes. GE Healthcare is developing such solutions, according to Dr. Pigeau. “The field is currently working at the 1 L scale, and a suitable solution to meet near- and long-term clinical requirements is needed,” he explained. “One of the primary challenges in scaling to larger volumes is the difference in vessel configurations, geometries, and mass transfer. Further, GE Healthcare is partnering with the Federal Economic Development Agency for Southern Ontario and the Centre for Commercialization of Regenerative Medicine (CCRM), a leader in developing and commercializing regenerative medicine technologies and cell and gene therapies, to build a Centre for Advanced Therapeutic Cell Technologies (CATCT) in Toronto. This initiative plans to “BridGE” the gap of industrialization for cellular and gene therapies. 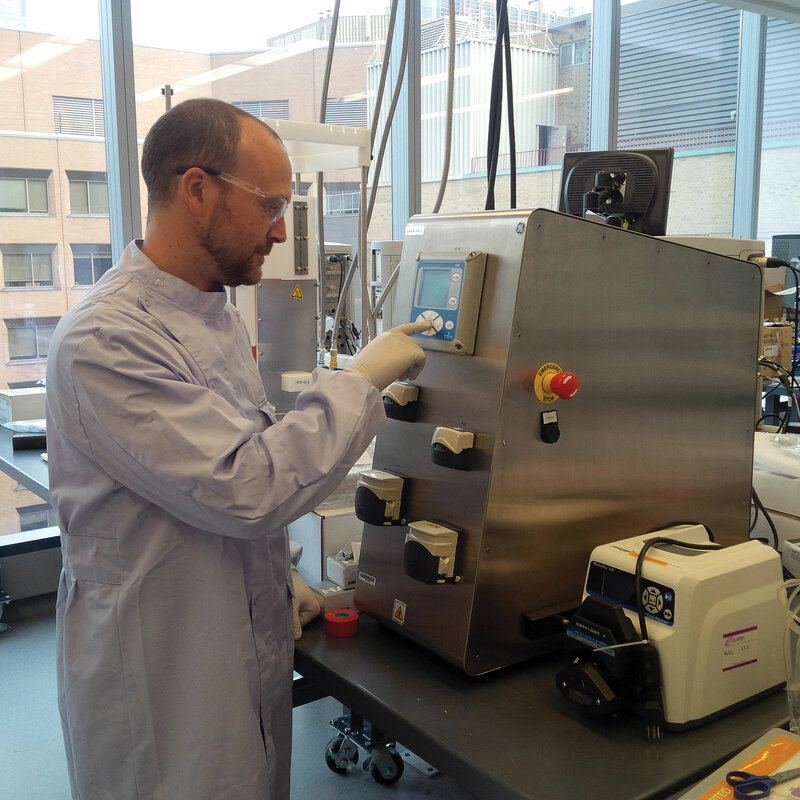 Gary Pigeau, Ph.D., development manager, cell therapy, GE Healthcare, is shown working on a stem cell project. The company has begun a new collaborative initiative to “BridGE” the gap of industrialization for cellular and gene therapies. 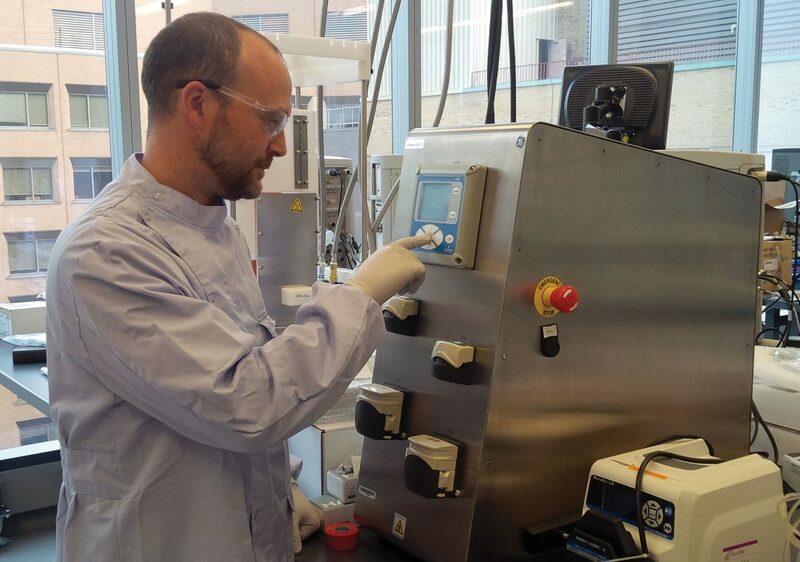 This initiative recently demonstrated the production of 8 billion cells in one 8 L batch. The company’s Xvivo System includes incubators and hoods, all integrated together as co-chambers and sub-chambers to provide aseptic conditions. BioSpherix Medical’s Xvivo GMP System is designed to provide an economical alternative to cleanrooms. The system consists of interconnected modules that can aseptically enclose any cell process. 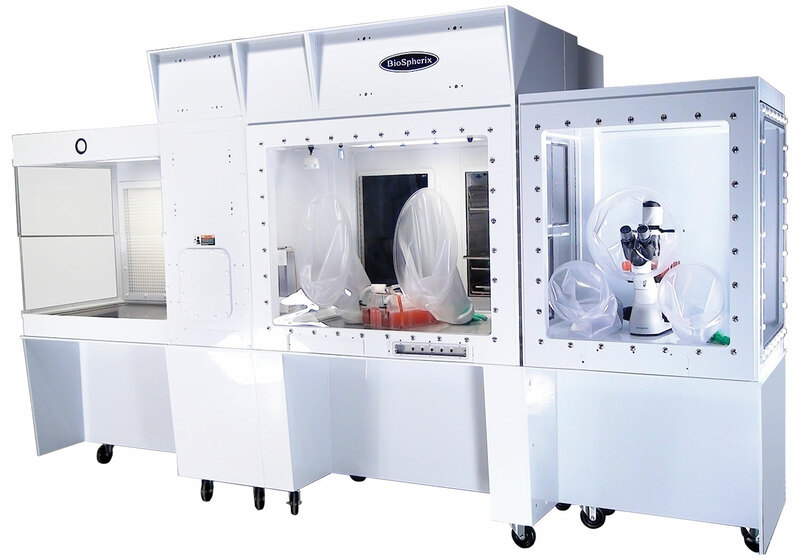 Modules such as “clean benches,” closed incubators, and closed hoods can be reconfigured as needed. There are many links in the supply chain for regenerative medicine and stem cell products. Partnering with skilled experts may enhance the process. “It is important for companies wanting to build a cell therapy supply chain to select partners fully versed in all aspects from collection to administration,” advised Beth Shaz, M.D., chief medical and scientific officer of Comprehensive Cell Solutions (CCS), a division of the New York Blood Center (NYBC). Another issue is that not all stem cells are alike. For example, hematopoietic progenitor cells (HPCs), unlike embryonic stem cells, are collected from sources such as peripheral blood, cord blood, and bone marrow. HPCs can develop into any component of the bone marrow and immune system, including red blood cells, white blood cells, and blood platelets. NYBC’s newly commercialized HPC product, Hemacord™, is the first FDA-approved and licensed allogeneic HPC-cord cell therapy. Following infusion, the cells migrate to the bone marrow, mature, and move into the blood stream, partially or fully restoring normal blood cells and their functions. The product can treat certain blood cancers and some inherited metabolic and immune system disorders.